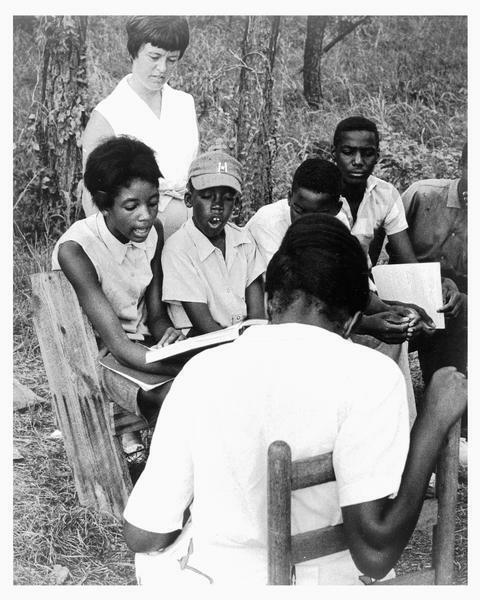 A group of African American students participating in a Freedom School class outdoors during Freedom Summer. The class, which was held on Tougaloo College campus, was led by Joanne Gavin, who is standing behind the students. Seated on the far left is Hymethia Washington, who is holding a book. Charles, who is wearing a baseball cap, is sitting next to Hymethia. RESTRICTED: For reproduction and licensing rights, contact copyright holder. This image is part of the Staughton Lynd Collection which includes papers and photographs from the leftist historian and labor lawyer who was prominent in both the civil rights and the anti-war movements. The majority of the papers cover the mid-1960's to the early 1970's, with the emphasis on the varied social movements and radical activities with which he was affiliated rather than on Lynd himself. Articles and writings, correspondence, and clippings and other printed matter refer to campus protests of the 1960's; civil rights; the Vietnam War; tax reform; the Kennedy assassination; Jobs or Income Now (JOIN), a group which sought to organize the poor in Chicago; union organizing, especially among public employees in the Chicago and Gary, Indiana, area; the Mass Party Organizing Committee, a group which attempted to formulate a mass, Leninist, working-class party; and the New American Movement, a group which sought to build a mass-based democratic socialist movement in the United States.